Back to School and "finally", cooler air temperatures - signals that Summer is soon coming to an end, but not for the Garden! The garden will continue to bless us with many blooms and fresh organically grown veggies right up until a killing frost. Gardening never gets boring. No season is ever exactly the same. This year, we've been having great success with Jersey tomatoes and Swiss chard. Nutritious Swiss chard has earned a forever place in our backyard garden for producing all summer long. We're still picking Italian basil in patches and breaking the leaves down in a food processor, preserving it simply in olive oil (faster than pesto) for later use in cooking. And, we've learned that potatoes can safely wait beneath the ground and dug up as needed. Plumeria Frangipani buds getting ready to bloom. Can't wait to see this beauty from NOLA! Many vegetables (especially tomatoes, basil and peppers) can be easily grown from seeds started indoors (around St. Patty's Day) and transplanted out in early Spring. 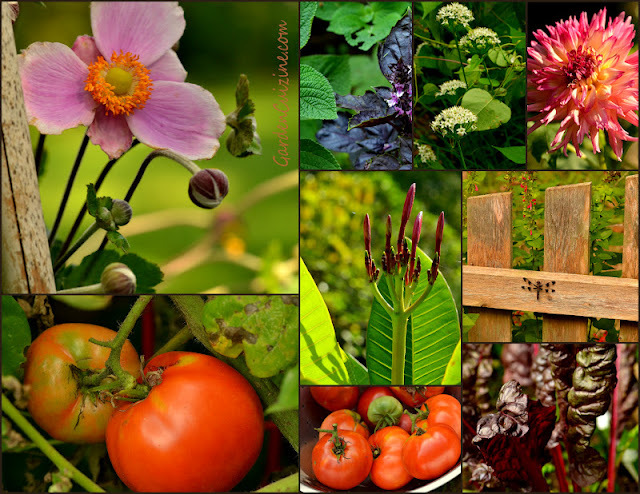 Start planning a garden now for next year and experience the joy of having your own backyard produce market. Garden Note: You don't have to wait until next year; it's still not too late to plant Fall veggies right in your own backyard or in pots on a sunny porch or deck. Try arugula, kale, radishes or lettuce - all are easy to grow Fall veggies. Having a cover to keep frost off the plants helps extend the growing season. Fall Equinox is officially here September 22, 4:44 P.M. EDT. Photo collage and blog post Copyright (C)2012 Wind. All rights reserved.